Spring in Ontario, Maple Syrup, Apple Blossom, birds return, how we love Spring! Spring in Ontario arrives in late March, and lasts through April, May and early June in this area of the country. It is a great time to enjoy the area beauty spots, when tourist attractions are quieter and you can spend time outdoors enjoying the longer days and mild weather. It was still cold when I photographed these children on a School field trip to the Sugar Bush to learn about Maple Syrup production. 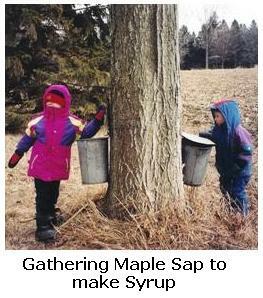 During early spring in Ontario, this area becomes busy with the activity of gathering sap to make Maple Syrup. While the snow is still on the ground the warmer days start the sap rising in the Maple Trees. The time when the sap can be harvested is short, so farmers must make the most of this time and are busy gathering the sap. Even with modern methods, the sap still has to be gathered in the traditional ways - by pail, where the sap drips from a spigot which has been hammered into the Maple tree. You can see this in the picture here. Other farmers use a pipeline, which is when the sap is gathered by pipes which are run from tree to tree, through the stand of maple trees. The pipes gather the sap and run it to a central collection vat. 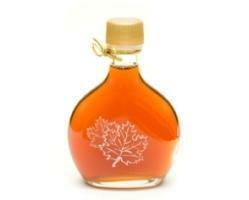 It takes 40 litres of sap to make 1 litre of Maple syrup, so it is a time and labour intensive task. After filtering, boiling and bottling, Maple Syrup is great on morning pancakes and a delicious sweet treat on desserts and ice-cream. 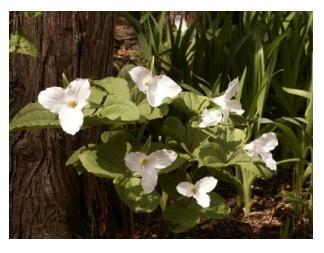 The Provincial Flower of Ontario is the Trillium which is found in woodland areas during spring in Ontario. This lovely flower, with it's three distinctive petals of white or pink, is a sure sign of spring. are a protected species and should not be picked or dug up to be taken home. With Southern Ontario’s many green spaces and parks, spring is particularly attractive when trees and spring flowers are in bloom. 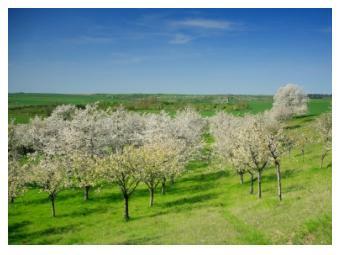 If you have chance, try to take a drive through the countryside when the fruit trees are blossoming, usually in late April or early May. Particularly beautiful in spring in Ontario are the orchards of apple trees where the blossoming trees look lovely, row after row - Mother Nature showing her stuff! In this area of Ontario pears, peaches, apricots, plums, cherries and grapes are grown. It is a wonderful sight to see the various colours of blossoms on the different types of trees at this time of year. Cherry, apple, peach, apricot, nectarine and pear trees - all are flowering now and are so beautiful to behold. Soon, the luscious Strawberries will be ready, and then we will know that summer is almost here! There are many farms where you can pick these delicious berries in late Spring / early Summer in this area. At this time of year, those of us who enjoy Rhubarb are waiting for the first stalks to be ready to pick - who doesn't love Rhubarb Pie! All around Southern Ontario there are orchards a-plenty, so take a week-end drive through the area and enjoy their beauty at this time of year. Another magnificent spring-flowering tree is the Magnolia which, although it is more common in the Southern USA, grows well in this area. 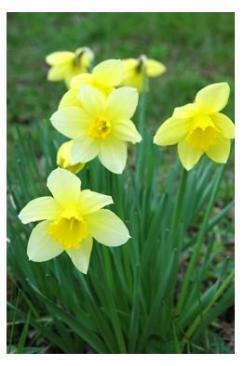 are also popular with Southern Ontario gardeners, with Daffodils, Tulips and Hiacinths growing well here. 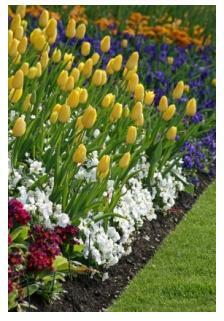 Each spring I am amazed anew by the abundance of flowers that heralds spring - the spring bulbs are glorious! This area experiences such cold winters and yet, each spring in Ontario the bulbs herald the arrival of spring with their lovely colours. My favourites are the Tulips and Daffodils which grow in abundance in our garden and old favourite varieties such as King Alfred, do well and spread each year. During Spring in Ontario we see the return of the birds that wintered in the south. This is the time of year when the Robins, Killdeer , Red Winged Blackbirds, the lovely Hummingbirds , the majestic Tundra Swans, Baltimore Orioles and many other birds, return to this area to breed. This female Ruby Throated Hummingbird is feeding at the back-yard bird feeder and, if she nests nearby, will bring her babies to the feeders throughout the summer months. 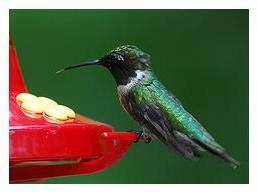 Check out our pages on Birds of this area of Southern Ontario for more information. Being in the Northern Hemisphere, the seasons in Southern Ontario are at the same time of year as Europe, however, I always find that spring arrives here a little later than it does in Northern Europe. From around mid-March and for two or three weeks afterward, the Tundra Swans migrate through this area. Having wintered on the Atlantic coast, in Chesapeake Bay, Maryland, these beautiful birds rest at several places in this area as they head for their breeding grounds in the Arctic and Alaska. On the second week-end in May, Canadians celebrate Mother's Day as a special day to remember and treasure Mothers, past and present. In May, Canadians celebrate Victoria Day, which is on the Monday prior to May 25th, with a long-weekend as that Monday is officially a day off work for most people. 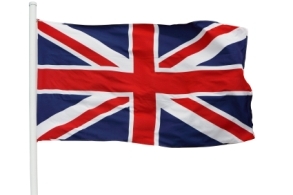 This day commemorates the birth of that beloved British Monarch, Queen Victoria, on May 24th 1819, and reminds us of Canada's long links with Britain. Let's not forget that the Queen of England is also the Queen of Canada you know! Known as the "May 2-4 Week End" it is the end of spring in Ontario and is the start of the summer season here. Many people use this long weekend to open up their cabins and cottages, or to spend time in their gardens planting their vegetables and annuals. Learn more about these beautiful, jewel-like birds that arrive in the spring and spend their summers here in Southern Ontario.